of value to subzis, dals and other dishes, when used in moderation. While it is used whole in many preparations, it is added as a powder to many. Since the fenugreek seed has a hard shell, it might be soaked or roasted before powdering. Roasting also enhances the flavour and aroma, making the powder all the more desirable. • It’s always better to buy whole seeds and then grind them at home for maximum taste, and also to avoid contamination. • Buy uniformly sized and yellow coloured seeds with maximum aroma for this purpose. • If buying readymade powder, choose a good brand. Check the seal and use-by date before purchasing. 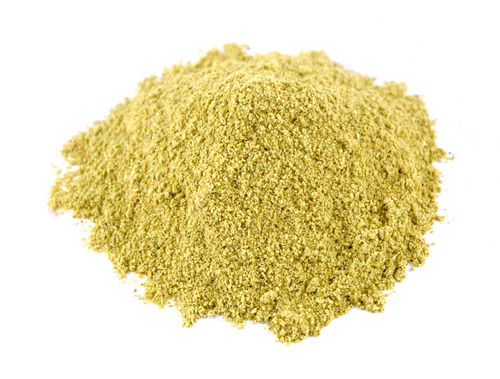 • Fenugreek seed powder has been used as a spice by the Indians and Chinese for centuries. It adds to the taste of curries, gravies and other preparations. • Fenugreek powder is sometimes used to impart a maple-flavouring to confectionery. • Flour mixed with ground fenugreek makes spicy bread. • Unlike the seeds, fenugreek powder can lose its aroma quite soon. • Hence, powder in small quantities as and when needed. • If required, store in an airtight container, unrefrigerated. • Fenugreek is known to have great medicinal properties, especially for cleansing the body, decongesting the lungs, controlling cough and improving immunity. Using a powder of fenugreek helps to quickly prepare decoctions and other medicinal concoctions. • Fenugreek powder has been used fairly extensively by lactation consultants to increase milk production in nursing mothers. • A teaspoon of fenugreek powder had with a glass of warm water on an empty stomach, it helps to control blood sugar levels. • A concoction of fenugreek powder with lime juice and honey helps to stimulate the appetite. • A tea made with fenugreek powder, sweetened lightly with honey, helps soothe the stomach and to relieve headaches too.